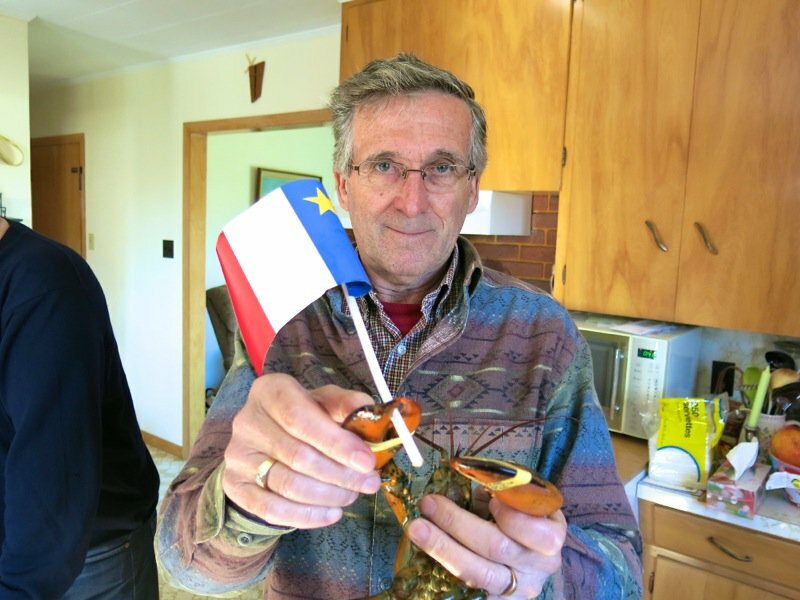 Bet you only thought people were Acadian, but no! There are Acadian Lobsters, too! 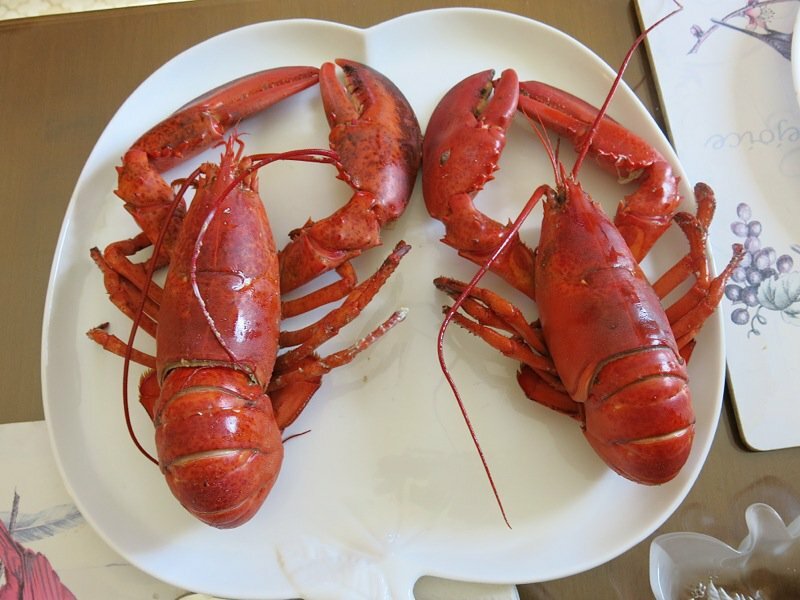 Every single lobster caught by an Acadian fisherman is obviously an Acadian Lobster! 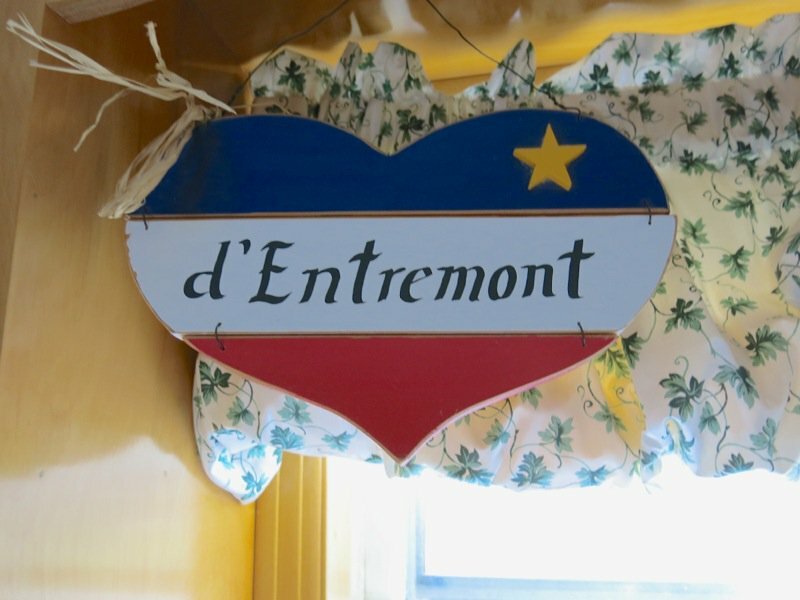 Above, Réal d’Entremont has one of the two lobsters Captain Sherman d’Entremont gifted us when lobster fishing earlier this day, proudly wave the Acadian flag. 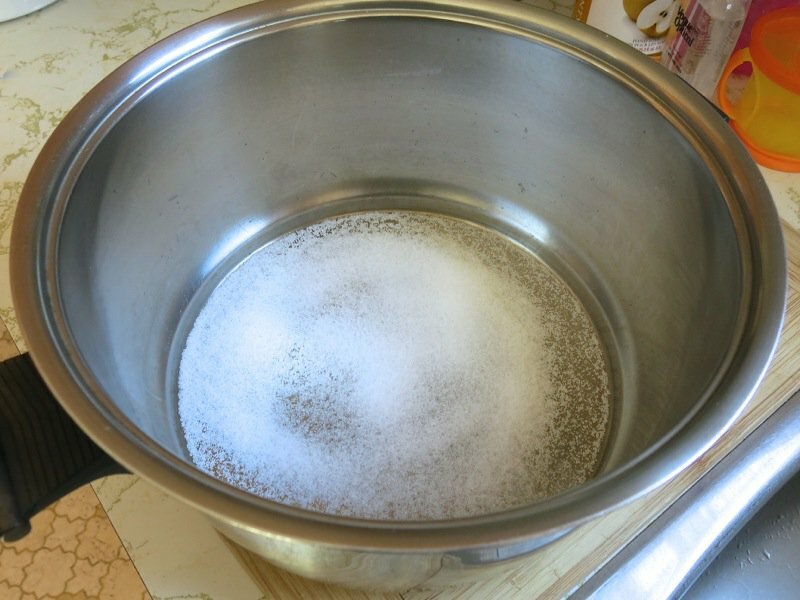 Réal told me that had he known we were coming home with lobster, he would have scooped a bucket of Atlantic Ocean salt water to cook them in, but the water around the wharf would obviously not be clean enough, so he is making his own salt water concoction. 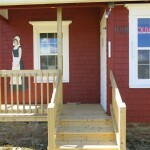 Eating lobster at Ryer’s near Peggy’s Cove was the first time this prairie gal learned that the ocean water is preferred for lobster cooking. Already, the lobsters are turning a little orange around the gills (That is my joke for the day.) They haven’t even been heated yet. 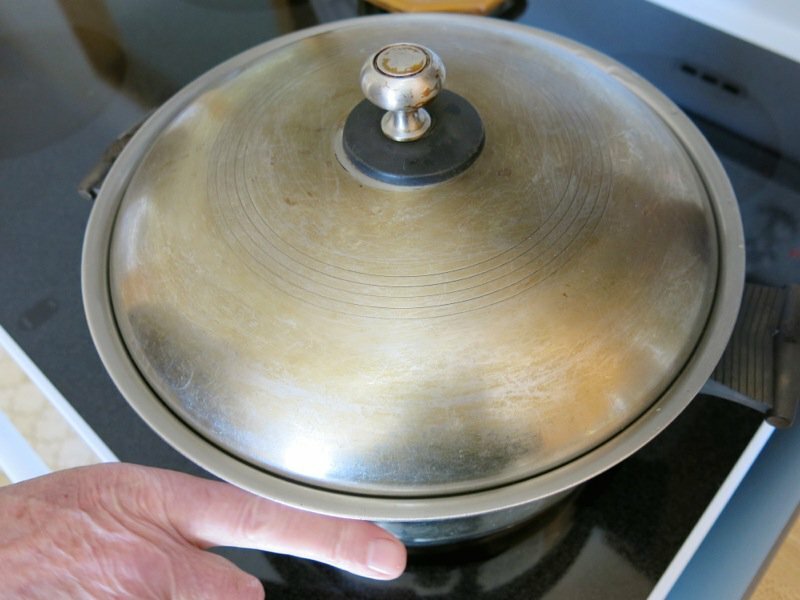 Lid on, medium-high heat, he steams the lobster. 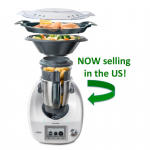 “That’s how we do it.” But, don’t you boil it? “No! Never! 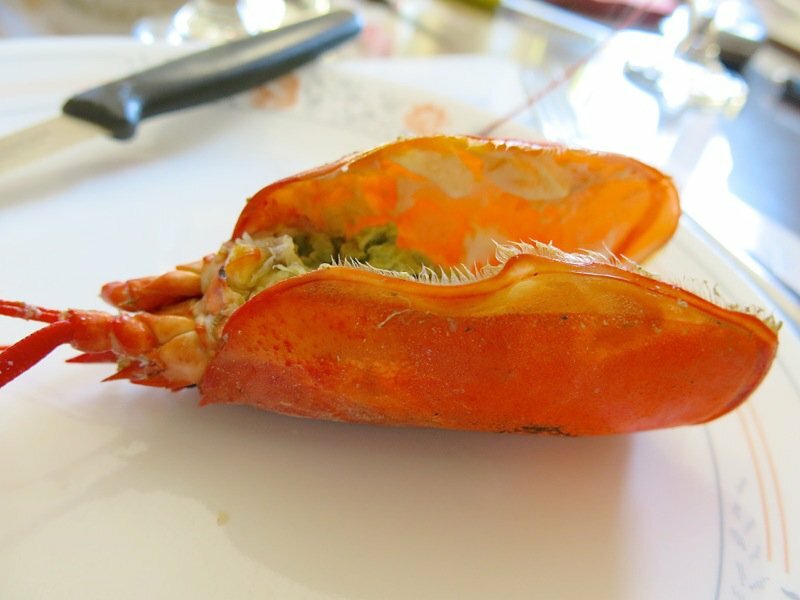 Lobster should always be steamed for the most succulent meat! Think about it,” Réal continued, “lobsters are full of water, so steaming them is the best possible way of cooking a live lobster. 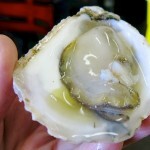 [Once steamed, that water inside of the shellfish evaporates].” Now, this was news to me. Never heard of steaming lobster, yet this is a lobster fisherman teaching me how to cook lobster, and he comes from 400 years and 9 generations of lobster fishermen. I believe I am about to learn something very special here. 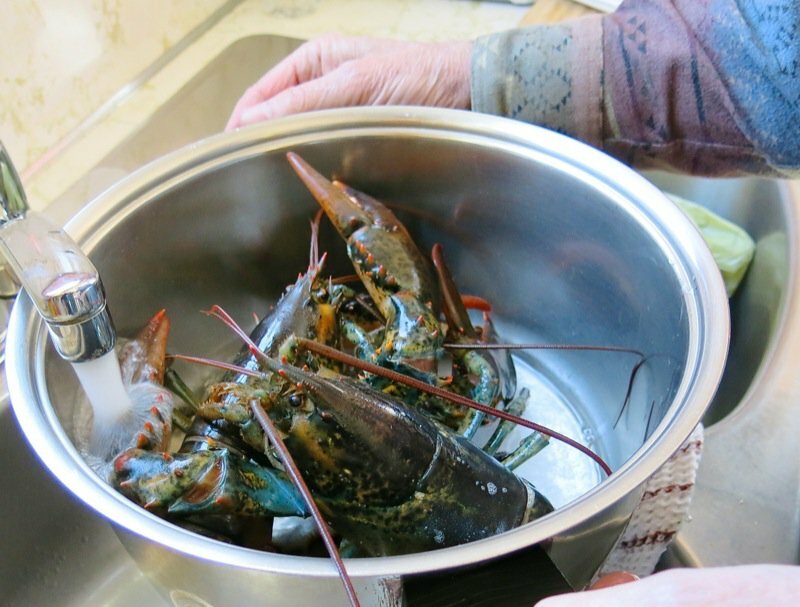 Upon researching steamed lobster arriving home, I did learn that it is the fishermen from Southwest Nova Scotia, and Acadian Nova Scotia that do traditionally steam their live lobster. “Now, how long will you steam it, Réal ?” About 9-10 minutes was the answer. 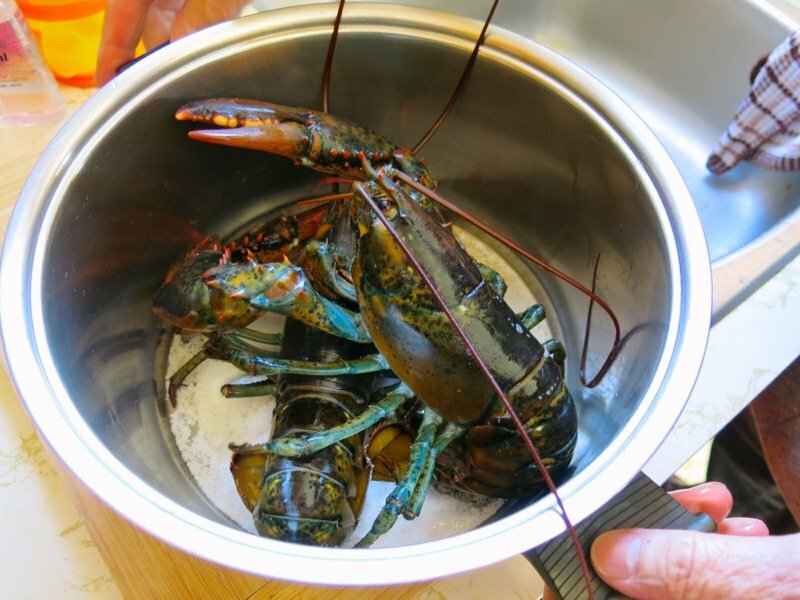 It actually took about 15 minutes as he had 2 lobsters in the pot, not just one. 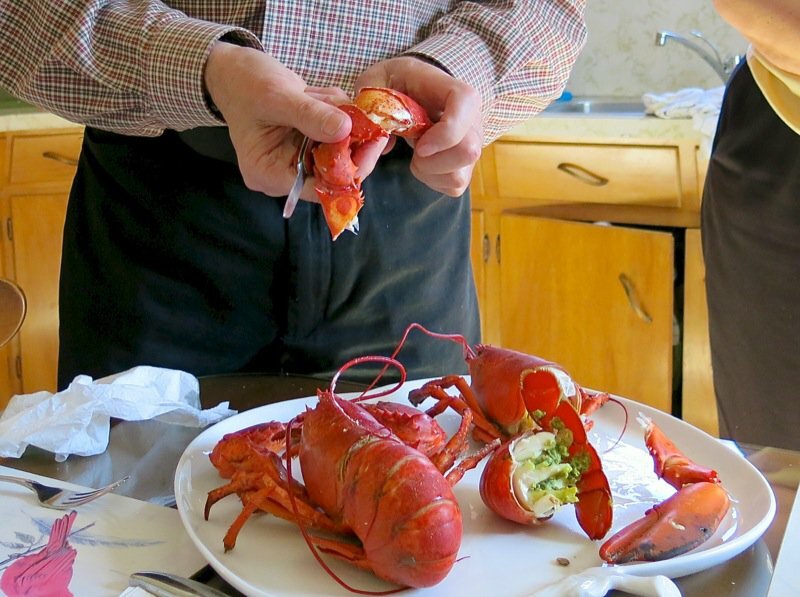 The “done” test happens as he peaked into the area of the lobster behind the tail to see if the lobster tomalley was set. When the tomalley is set, the lobster is done! 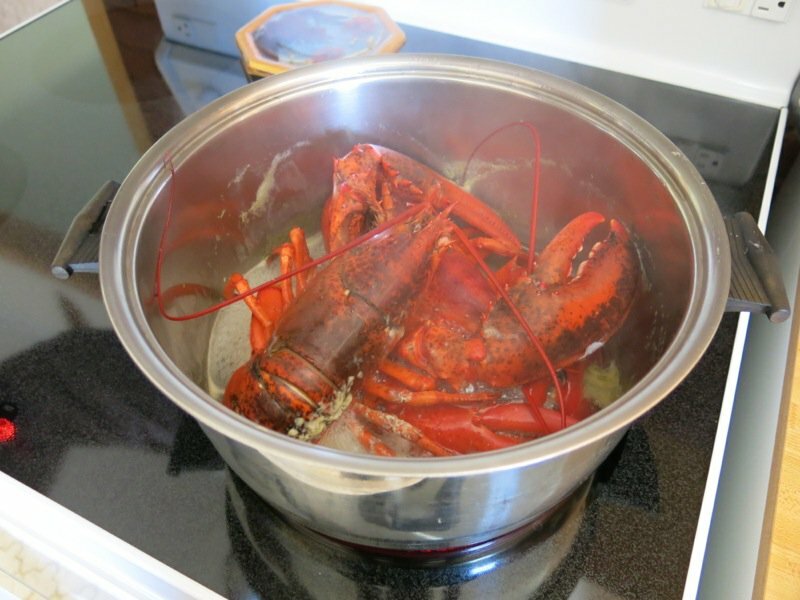 Clearly, it will remain cooking a bit, after being taken out of the pot, if left to set; however, no one leaves their lobster to set. Another test for doneness, if you don’t care that your lobster will be missing a feeler for plating, to pull the feeler: if it comes off, it is done. Réal did not do this, but if you haven’t just brought you lobster from the wharf that day, once hot from the pot, a quick spray with cold water (not enough to cool the meat) will help the meat release from the shell better; however, Réal did not spray his with cold water and it released perfectly from the shell. 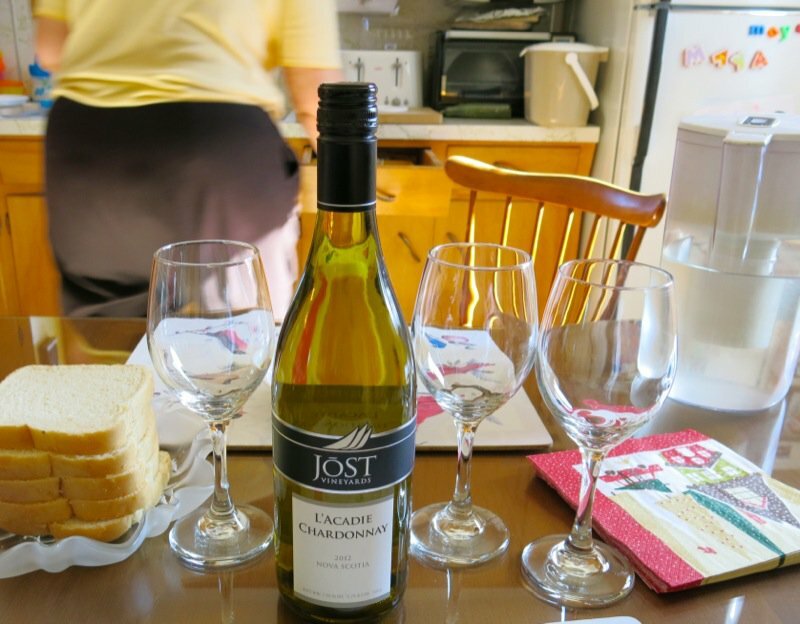 A bottle of Acadian Jost wine to compliment this lovely preface to dinner, and we are ready to dig in. But, first, a lesson on how to shuck a lobster, from Réal. 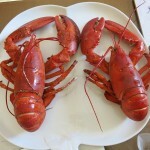 The two lobster, above, were the largest two brought in during our lobster fishing experience a few hours earlier. 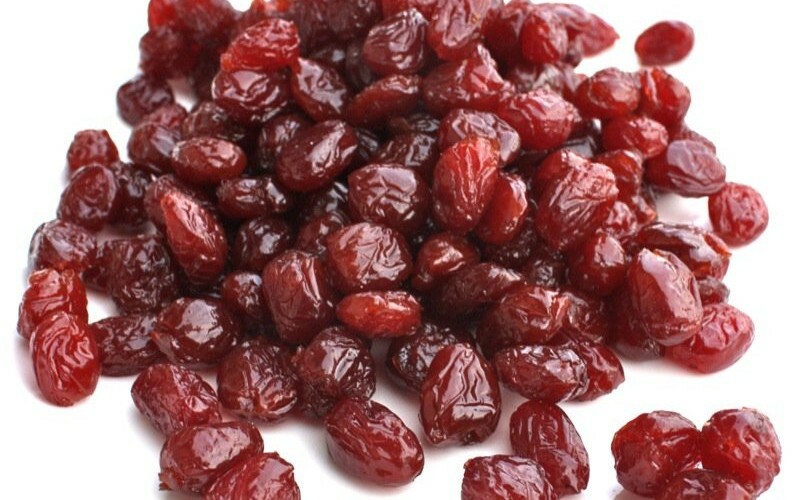 That being said, they are most likely just over canner size, or close to 1 1/4 pound each. Réal is a bit too quick demonstrating his shucking technique for me to photograph, or even to take it all in. The first thing he did was to separate the tail from the body, above. 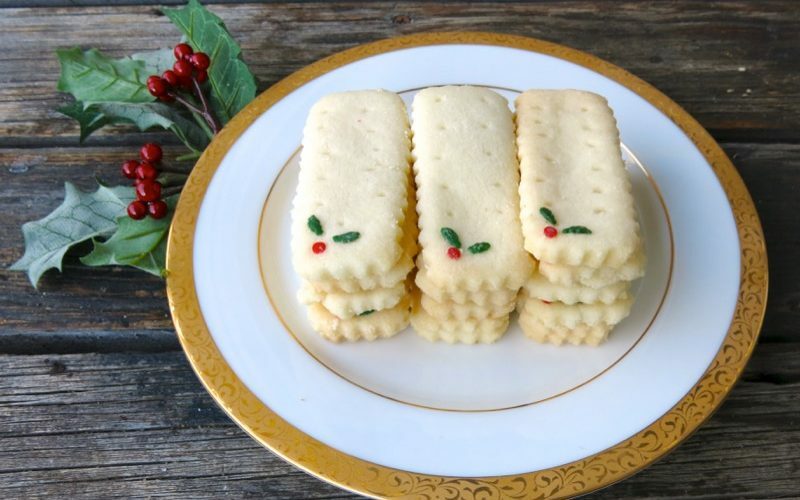 Having the tomalley presented to me this way, it was instantly understandable how it would be considered the delicacy it is, by so many. It is simply a gorgeous presentation. 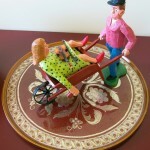 Bernice was after the tomalley. “This is my favourite part!” Honestly? She did look to be enjoying it, but maybe she learned how to love it? 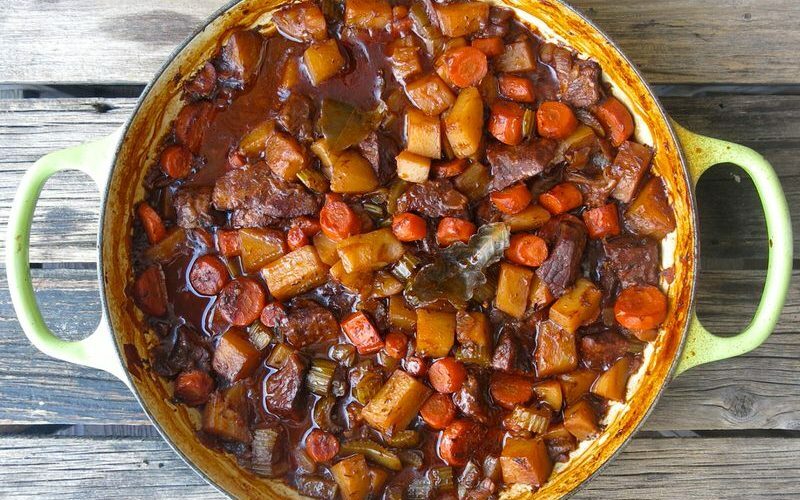 Mother’s usually get the leftovers of everything and save the plump and juicy morsels for their family. 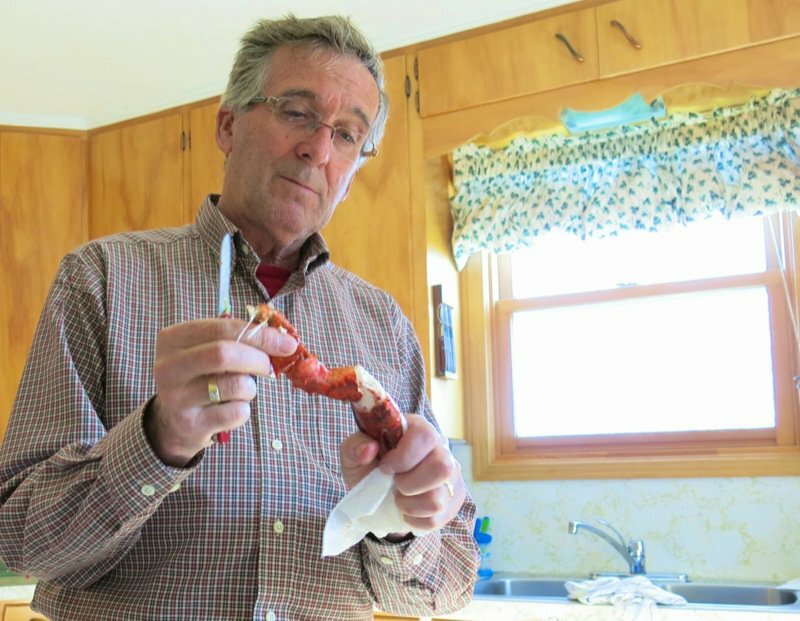 “Réal’s favourite part is the tail.” This did surprise me after my very first experience eating a live lobster fresh (almost) from the sea in Tatamagouche (from the Wallace Wharf Haul) where I realized the tail was kind of chewy compared to the succulent knuckles, legs, and claws. So, we made sure to leave Réal the tail, and in the end, one was actually left over! The claw meat was actually his favourite. 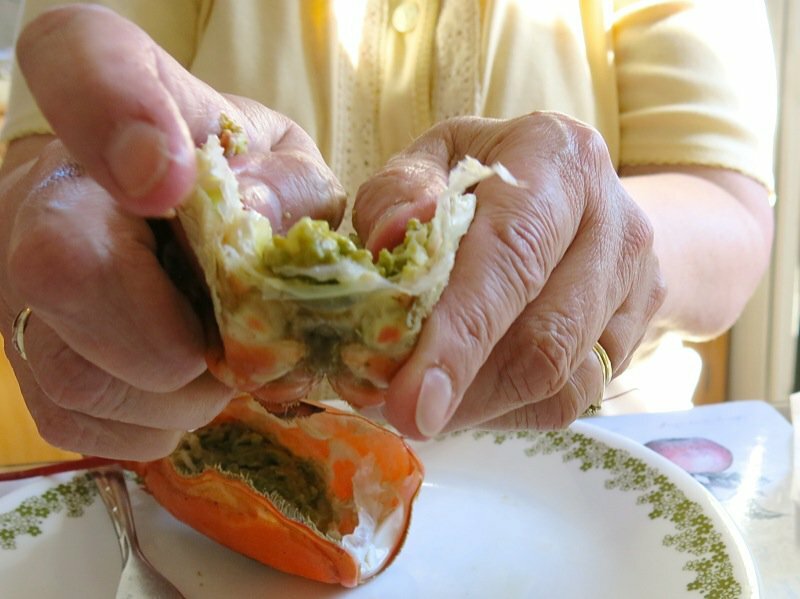 Bernice gave us a lesson on how to eat the lobster meat next to the “ribs” surrounding the tamale. 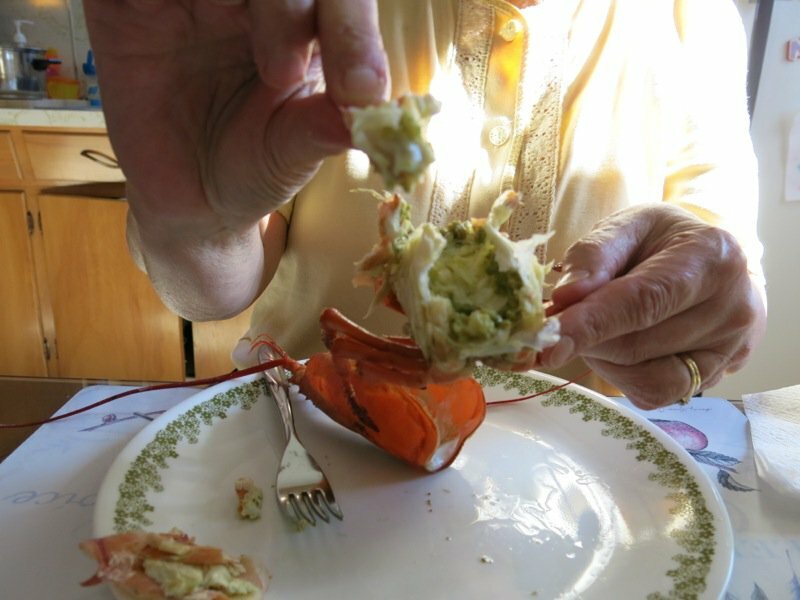 It was difficult to capture, but suffice it to say, every morsel of this lobster is eaten and enjoyed with ultimate satisfaction. Neither Vanja or I care for the tomalley, but I do love the meat around the tomalle. 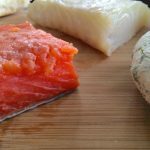 I usually work much harder to get that green tomalley off of the flesh, as the flavour of it is strong, and off putting to me. 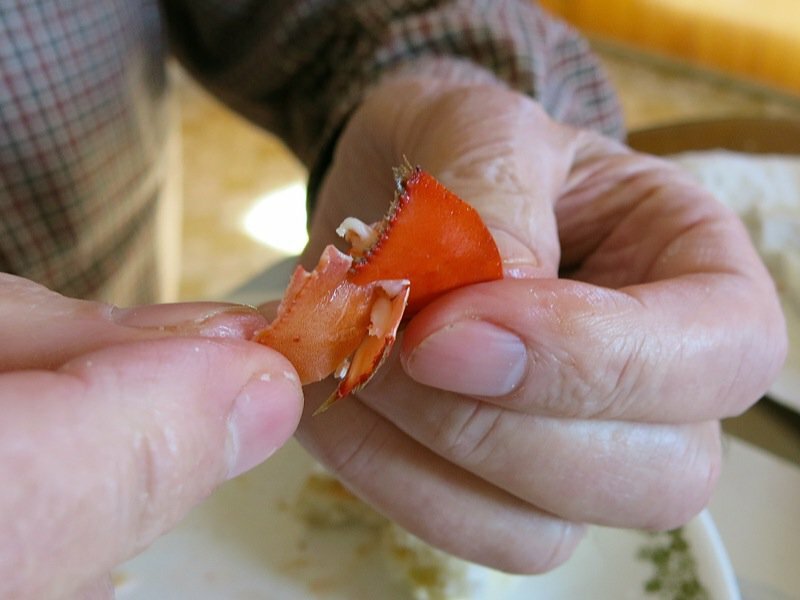 Yet, so many find this part of the lobster another delicious experience. Watching Réal get the flat translucent bone out of the middle of the claw was captivating. He was obviously a pro. The round, flat, see-through bone that is inside of the claw, below, came out effortlessly, in one piece, leaving the clawmeat completely boneless. Above, you can see where the flat bone was in the claw meat. I never knew that there was meat in the tail fin, did you? Réal showed us how to get at it by using a very sharp knife to get into each fin on the tail to extract that sliver of meat, and who could imagine that such a tiny sliver of meat could have so much flavour and texture. I was all over everyone of those little tail fins! We had such a lovely little meal together. I appreciated being welcomed into their home. It was such a highlight. 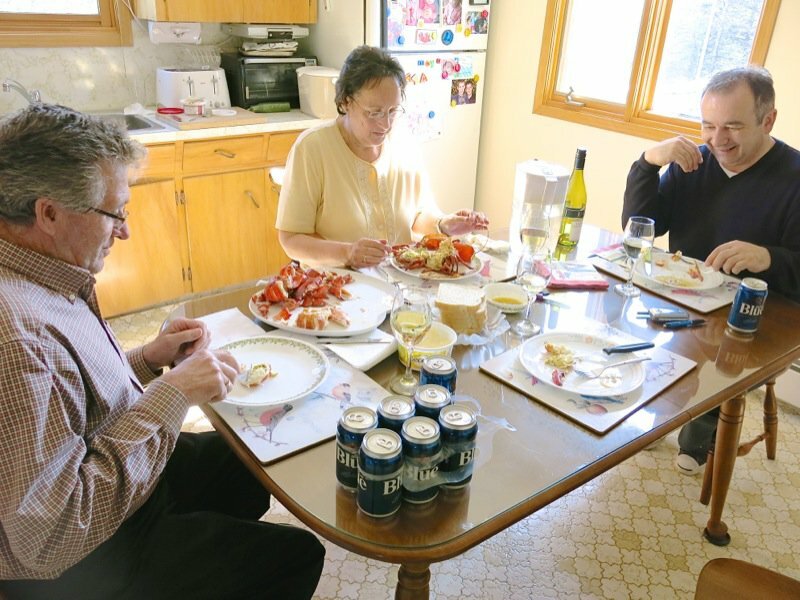 Now, it was very difficult to leave lobster on a plate, but we were going out for dinner in an hour, and Bernice said that the leftovers would be used in their Traditional Acadian breakfast in the morning. 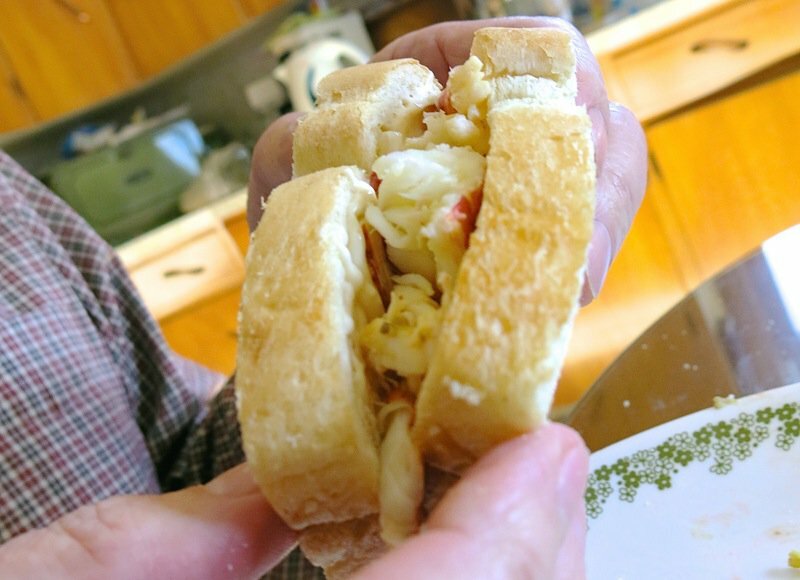 It was endearing to see Réal reach for a slice of white bread, slather it with mayonnaise, and stuff it with some lobster meat and devour it with such relish. Clearly, this is one of his favourite ways to eat lobster meat and was delightful to witness! 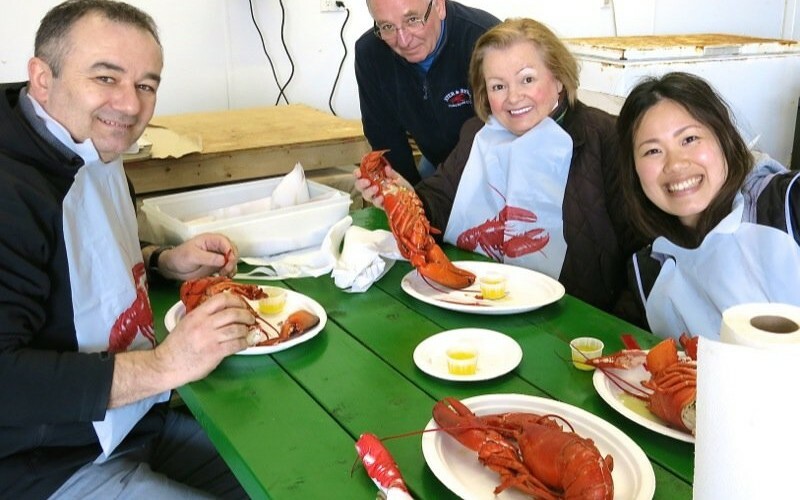 If NOT picking your lobster up at the wharf from the lobster fisherman, how do you pick the best lobster? The darker the shell, the more meat. Not always, but usually. Check the feelers. If they are long and untouched, the fresher the lobster. If they are broken, they may have been in a holding tank a few weeks. 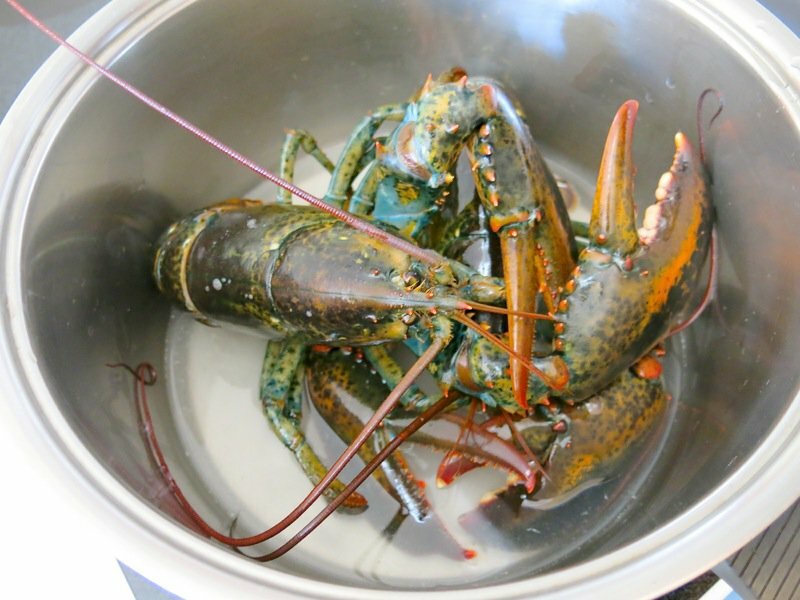 Doesn’t mean that a lobster with broken feelers that has been held in a tank for a few weeks won’t be delicious, and maybe even more tasty than one with full feelers, but usually the one with the full feelers will be tastier and fresher. 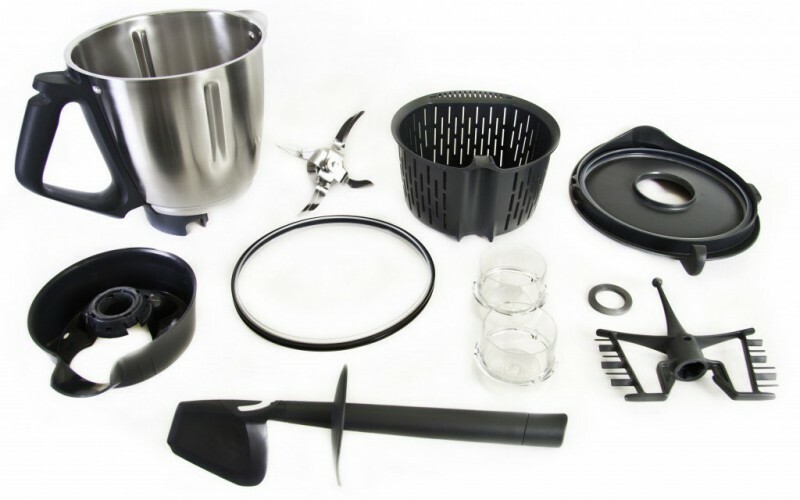 Note: Cook within 48 hours of purchasing the lobster. 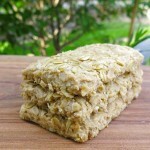 It will keep well in the bottom of your fridge (to avoid cross contamination) for that amount of time, but no more. 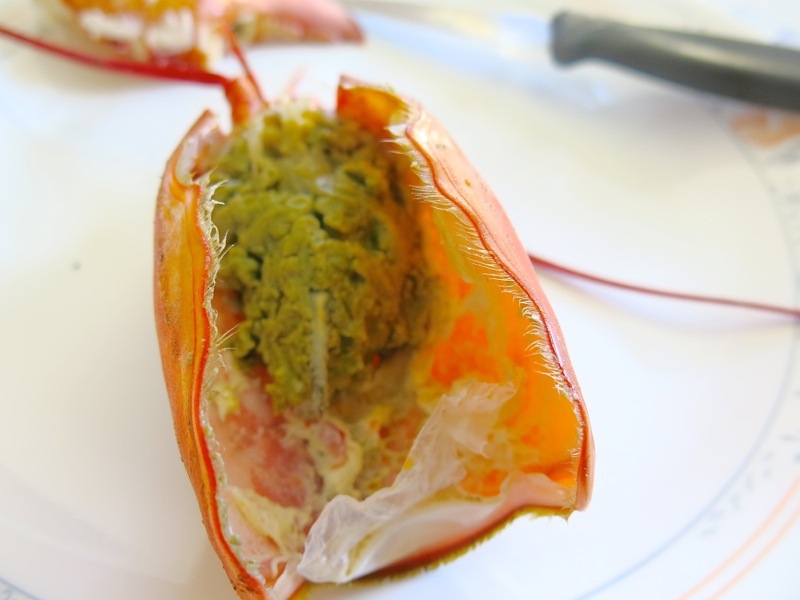 Lobster fishermen in Pubnico steam lobster to maintain its delicate flavour and texture; Réal d'Entremont shares this local heritage recipe from the Acadian Fishermen of Pubnico and the Nova Scotian South Shore Lobster Fishermen. This recipe is for 2 whole lobsters. Yes, I bet that sea salt would be the next best option! Mussels are also better steamed in sea water. 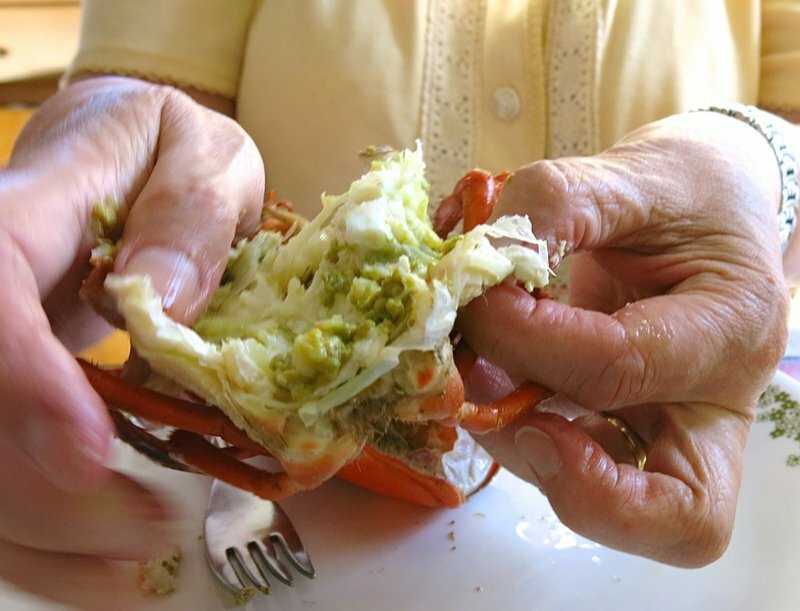 I often see people cooking lobsters on TV with the rubber bands still on the claws. 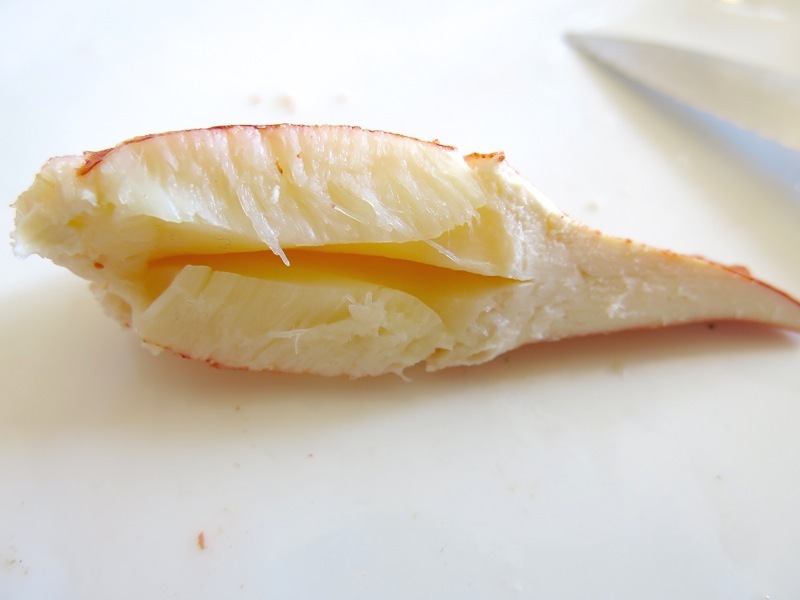 Sometimes this makes everything taste like steamed rubber so you’re better not taking any chances and being sure you are removing the bands. Excellent advice, on both issues. 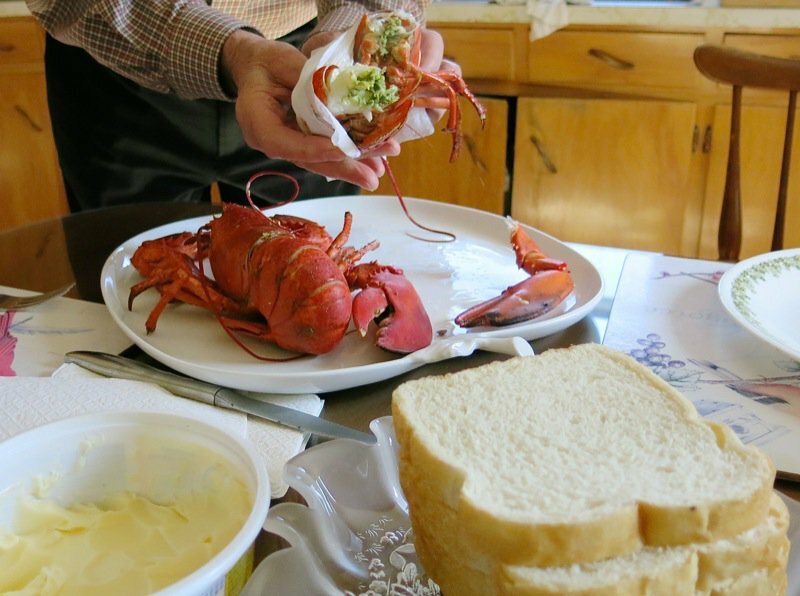 When in Cape Breton, a gal told me to always be sure to ask when going to a “Lobster Dinner” or a “Church Supper”: Do you remove the elastic bands? 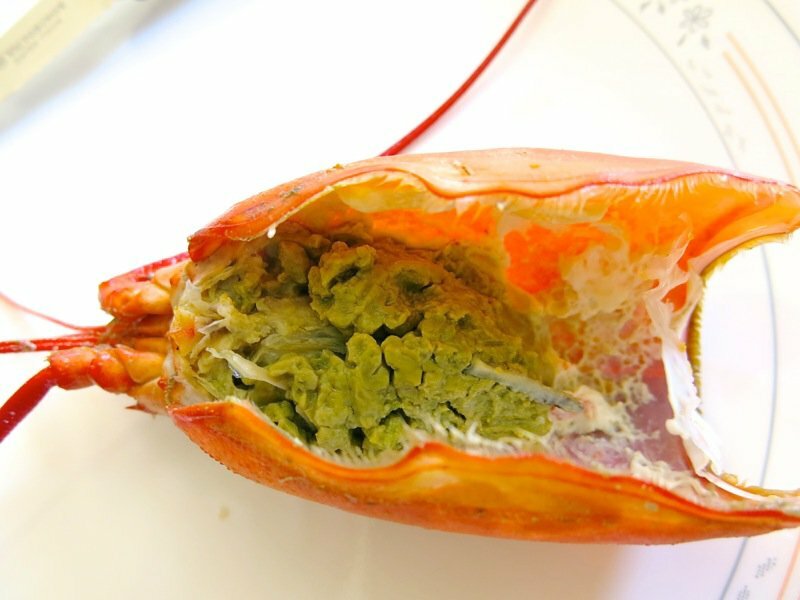 Not only does it affect the taste of the lobster, it isn’t good for you! I was incredulous that some people would actually do this. She said, “Hey, it is way faster to cook them that way. 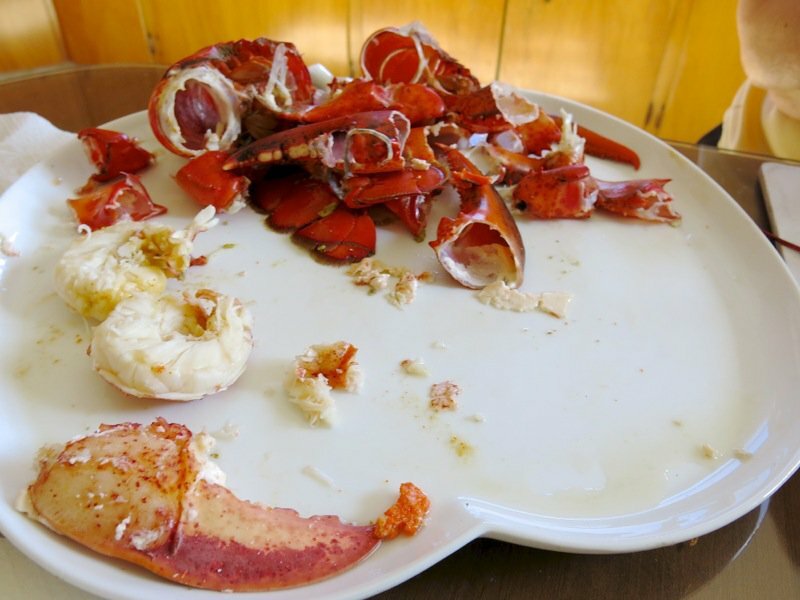 It is almost standard practice at these large lobster feasts.” My mouth just hung open. So, good to always ask. watching my brother and father (both lobster fishermen from the village next to Pubnico) shuck lobster is ridiculous- they manage to with their bare hands…. ! Tante Bernice and N’Oncle Réal are super cute in this post- and so fun to see you got to visit with them in their home! I felt the same way watching Real! He was so fast and it was effortless for him. 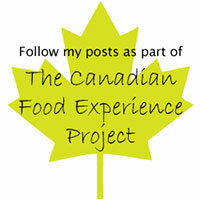 Both my husband and I feel blessed to have been guests in their home – you are right, we are super lucky! 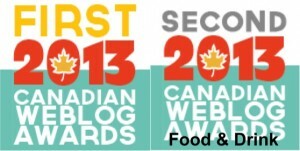 Thank you so much for chiming in! Lovely to hear from you. Love your aunt and uncle.